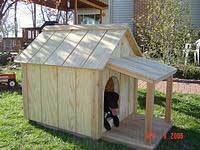 Build a small or large doghouse with free doghouse plans online. These plans all have detailed instructions and you can easily customize any of these doghouses to make it perfect for your own dog. 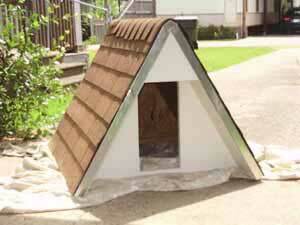 This dog house has a modern style with its rounded corners, domed metal roof, insulated walls and more. 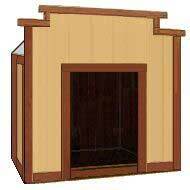 Designed to be warm in the winter and cool in the summer, this dog house will make any dog a happy dog. This small A-framed dog house is big enough to house a small or medium sized dog. Dog’ tend to like a smaller area for sleeping and staying out of the outdoor elements. Easy step by step instructions with a video illustrating each step will make building this dog house a breeze. Take a day and make this inexpensive, insulated dog house. This dog house easily fits a small or medium built dog and offers a tall opening for easy in and out. It’s A-frame styling helps make it easy to create with few required materials. Get started on this simple dog house today. Put a little of the old west in your backyard with this great looking western style dog house. Once finished this dog house looks like its right out of the days when cowboys rode horses. Adding the word “Saloon”, “Blacksmith” or “Sheriff” over the top of the door makes this dog house even more special. Here is a dog house that was specifically built for a small dog. Built out of plywood and a few other materials this dog house is easy on the pocket book. Protect your little pup from the outdoor wind, rain and cold by making a dog house he or she can stay warm and cozy in. Using these detailed instructions you can start building a strong and sturdy dog house. This dog house is larger than the average dog house, plus has plenty of inside room for housing a large dog. Each step has a picture demonstrating that step to help make this a fun and easy project. 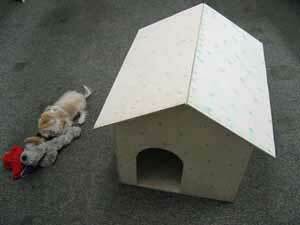 Here is an attractive dog house that’s designed with a removable roof for ease of cleaning the inside. The size of this dog house is perfect for a medium or large dog. There is a covered porch to help keep the entry clean and dry, plus it adds to the looks of the house. 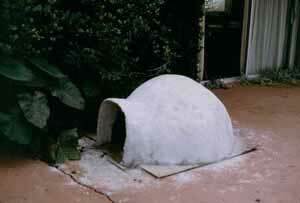 With wire mesh, concrete and this easy to follow project you can make your dog his own dog house shaped like an igloo. This dog house will certainly last for many years to come and doesn’t cost much to create. Keep your favorite pet safe and secure with this great dog house you made yourself.